An IRA can be an important part of your retirement income. Let us help you get started. 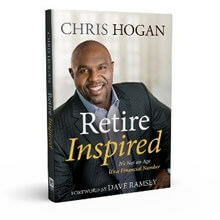 Contact us now to schedule an appointment and you’ll receive a complimentary copy of Chris Hogan’s “Retire Inspired”. 1 The rates of return used in this example are not indicative of any actual investment and will fluctuate in value. An investment will not provide a consistent rate of return; years with lower (or negative) returns than the hypothetical returns shown may substantially affect the scenario presented. 2 Maximum individual contribution, age 50 and over can add an additional $1,000/year “catch-up”.